Low oil prices are finally forcing the Arab sheikhdoms of the Persian Gulf to make some tough choices about how to tax their wealthy populations. For as long as oil traded at above $100 per barrel, the region could remain a largely tax-free area. That is no longer tenable. The International Monetary Fund expects the six members of the Gulf Cooperation Council (GCC) – including Saudi Arabia, Kuwait, Qatar and the United Arab Emirates – to post average fiscal deficits in the region of 13 percent next year after Brent crude fell below $40 per barrel. Tax is the obvious way to plug the estimated $275 billion gap. Gulf monarchies – which produce about a fifth of the world’s oil – have traditionally avoided imposing broad-based taxes on personal income, corporate profits and the sale of goods. While that means huge amounts of lost revenue, it has helped the non-oil sectors of their economies, which struggled to attract foreign direct investment, to grow. Introducing a direct tax on incomes in countries where political rights are limited may push citizens too far. So instead, policymakers are looking at other potential levies. The IMF has said that introducing a value added tax (VAT) across the GCC could raise up to 2 percent of GDP in revenue. The process has already begun. The UAE is studying a draft VAT law and ended subsidies on gasoline in 2015. Saudi Arabia – the region’s largest economy – has approved plans for a 2.5 percent tax on undeveloped land to stimulate property development on crowded cities and is also reviewing its policy of energy subsidies. But there is a quid pro quo: taxation often creates the expectation of representation. Limited elections are now taking place in all of the Gulf states. Should oil prices remain lower for longer, then GCC states may have no option other than to raise more government revenue from new taxes, or impose dramatic and unpopular cuts to spending and erode foreign reserves. Tax may come at a cost of further political and social concessions, but that looks like an increasingly unavoidable trade-off. 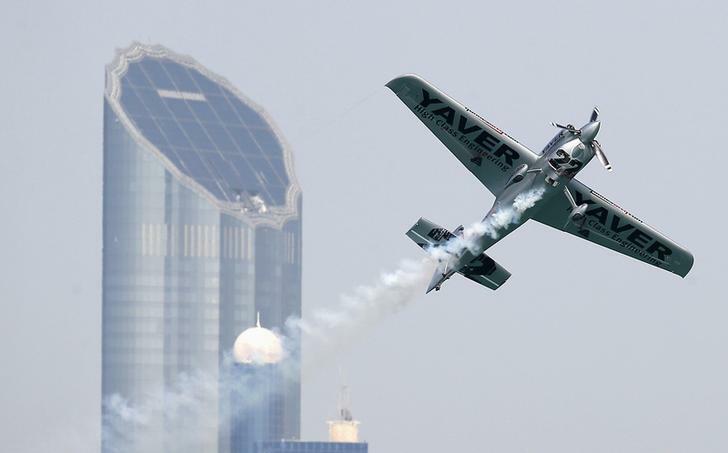 An aircraft flies during Red Bull Air Race in Abu Dhabi February 28, 2014. Oman’s top advisory council voted on Dec. 22 to increase corporate taxes. Faced with its first fiscal deficit since 2009, the United Arab Emirates is drafting new laws which may eventually see it introduce sales tax by 2018, Reuters reported on July 2. The UAE said in July it would cut subsidies on gasoline. The International Monetary Fund has urged the UAE to introduce excise taxes at a rate of around 5 percent and to roll out a uniform tax system for both foreign and local firms. Gulf Cooperation Council countries do not currently levy sales and income taxes.